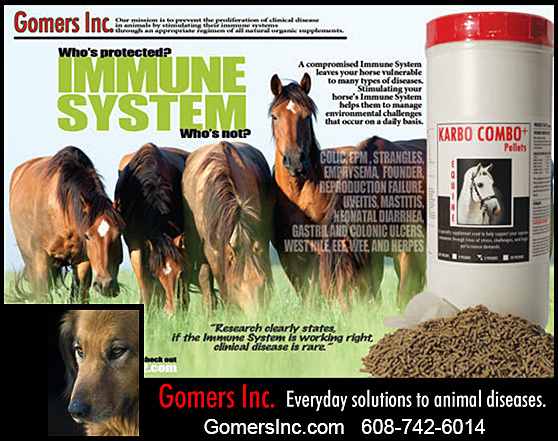 Karbo Combo by Gomer’s Inc. has been helping boost the immune systems and supporting the body to fight against bacteria, and even viruses that can weaken your dog’s body. What IS Karbo Combo Canine and Why Would Karbo Combo Canine Greatly Benefit My Dog? Well, we are glad you asked! In a sentence, Karbo Combo Canine is an aid to promote wellness and to support the immune system from daily stress and environmental challenges. To increase health, genetic expression and performance, eye health, hoof health, neurological health, digestive health—and so much more! You can read TESTIMONIALS on our website! Order Karbo Combo Canine Today! There is just no practical reason not to have your dog on Karbo Combo Cabine! For under $1.00 per day , the health benefits are limitless! Join the thousands of happy dog owners who have their dogs on Karbo Combo Canine today-- and call now! We are happy to find out more about the health concerns you are experiencing and how Karbo Combo Canine can help!